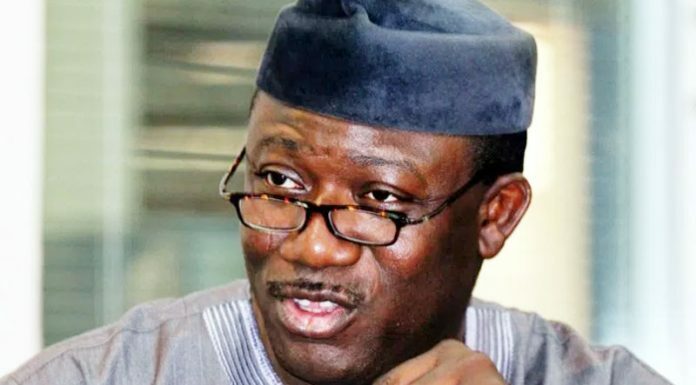 Ekiti State Governor, Dr Kayode Fayemi saturday lamented the rising spate of kidnapping in the state, disclosing that within seven days, suspected kidnappers killed one person and abducted five others in different parts of the state. Consequently, the governor urged Oâ€™dua Peopleâ€™s Congress (OPC) and vigilante operatives to support security agencies to rid the state of criminal elements, mainly the rampaging kidnappers that are perpetrating abduction in the state . He made the remarks at a meeting with the leadership of the OPC in Ado-Ekiti yesterday, canvassing multi-pronged approach to fighting the rising spate of kidnapping and criminal activities in the state. Precisely last Monday, former Commissioner for Lands in the state, Mr. Remi Olorunleke and the Director of Administration, Gbonyin Local Government Area, Mr. David Jejelowo, were kidnapped along Ado-Ijan road. This incident occurred barely a week an accountant with Emure Local Government Area, Mr. Abayomi Ajayi was killed by gunmen along Ikere â€“Ise road while two other staff from the same local government were abducted . Consequent, Fayemi had held a meeting with the leadership of the artisans, market women and Inter-party Advisory Committee (IPAC), assuring that they would benefit from the federal governmentâ€™s TraderMoni programme. Fayemi, who spoke through his Senior Special Assistant on Mobilisation, Mr. Tunji Ogunlola, said the state government was not comfortable with the kidnapping and killings of some local government officials and other Ekiti citizens in recent time. According to him, all hands must be on deck to put those with criminal tendencies at bay and safeguard the lives and property of the residents. He explained that the state government â€œneeds the backing of every resident of the state to tackle the menace because they will be at the receiving end if proper actions are not taken. The present administration will not tolerate criminals to hijack the system and destabilise the state. Although the state government had ordered the Police Commissioner, Mr Asuquo Amba, the Directorate of State Services (DSS) and other security networks to rid the state of criminals, Fayemi said the support of other stakeholders in security would help the conventional security agencies in the state. He disclosed that he had reinstated the sacked operatives of the scrapped Ekiti State Peace Corps â€œto show how committed we are to making Ekiti safe. We intend to recruit 800 operatives to work with the police across every community. â€œAs a respectable pan-Yoruba security group, OPC is also welcomed in the battle to make Ekiti safe. We need you because you are credible. You understand the terrain. We have that confidence in you that you can provide supports for the police in the area of providing information for the security agencies that will help their intelligence gathering for them to take proactive action. Fayemi urged the group to support the presidential aspiration of President Muhammadu Buhari and other candidates of All Progressives Congress (APC) in the 2019 general election. The governor assured that all the beneficial intervention schemes and policies shall be brought to Ekiti for the benefit of all Ekiti indigenes. He said the benefit has started manifesting with the payment of four month salaries, including one owed by former Governor Ayodele Fayose within a spate of two months he ascended the governorship seat.